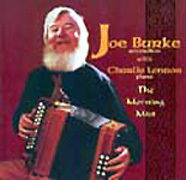 It's been several years (since 1996, to be exact) since we heard last from Joe Burke, but this new CD from the great Galway accordion player should sate his fans' hunger, and then some. Burke's playing is as crisp as ever on his glorious-sounding Bertrand Gaillard box, every detail is meticulously crafted, yet it always sounds so relaxed that one could be lured into thinking it would be so easy to play just like that... And the maestro has gone more than the extra mile here by recording no less than 21 tracks--you wouldn't get that from a record company! There are great reels and jigs galore, including the classic East Galway reel "Paddy Kelly's Four Part," virtuosic hornpipes, like "The Banks," lovely airs, among which "The Wounded Huzzar," even a spicy French musette piece, the whole accompanied with the perfection and subtlety we have come to expect from Charlie Lennon.